Built in 1933 by the LGOC as STL 169. One of the 2nd batch of the sixty seater STL1/2 class. Initially allocated to Hendon garage in June 1933, it was seriously damaged by a flying bomb in February 1944 and after a rebuild at Chiswick, it was returned to service in November 1944. 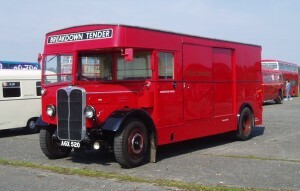 It was withdrawn in Oct 1949 and the body was scrapped at Chiswick. After a chassis overhaul and conversion to diesel, it was sent to Chalmers of Redhill, Surrey where it was fitted with a specialist body as a London Transport heavy recovery and towing vehicle, with the service fleet number 738J. First allocated to Dalston, it moved onto Cricklewood from where it was withdrawn in 1971 and sold into preservation. After passing through several owners it received a full body off overhaul in the late 1980’s but shortly after was 80% destroyed in an arson attack. Rebuilding commenced in 1992 but completion was delayed until 2002.